Her gracious spirit, steady strokes and entertaining play sure helped, too. No. 24-ranked Buzarnescu threw her arms in the air in triumph and hit a ball into the stands Sunday after closing out the match with a 107 mph ace on a day several Romanian flags were held in the stands. She raised her racket, waved and acknowledged those fans, too. 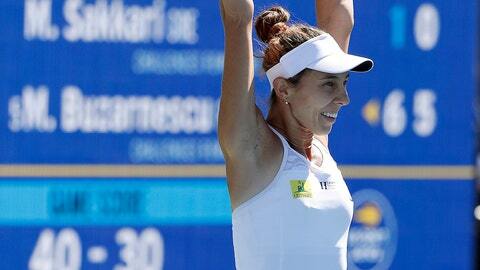 Buzarnescu, a left-hander who ranked No. 142 only a year ago and has come back from two knee surgeries, mixed her shots beautifully with laser groundstrokes to send Sakkari chasing down balls in the corners while adding some slice and drop shots. She is thrilled to be on the rise at this stage in her topsy-turvy career after considering what her next move would be beyond tennis as her troublesome knees baffled the doctors. Serena Williams, the Wimbledon runner-up, suffered a career-worst 6-1, 6-0 loss in her opener to Johanna Konta while playing just her fifth tournament since giving birth to her daughter last September. Sakkari eliminated Venus Williams in the quarterfinals on Friday night. Sakkari missed on four break-point chances in the final game of the first set, when Buzarnescu double-faulted twice, while the last two games of the opening set featured nine deuces. Sakkari reached her first career final after surviving near elimination — she was two games from losing — in a 3-6, 7-5, 6-2 semifinal victory against Danielle Collins. That was the only set she lost all week before Sunday. By the final, she was nervous and physically spent. “Maybe reaching top-10 is the next goal for me if I can ever be able to achieve,” she said.